Detectives Mortis and Bigelow are trying to crack a major case of unstoppable jewel thieves. A lucky break leads to confrontation between the police and the the thieves. where the detectives find that they aren't dealing with normal thieves instead they are zombies. Mortis is killed in the line of duty but he doesn't let that stop him as he returns from the dead to help his partner solve the case. Over the years I have heard talks of this movie, but never had the chance to watch it. Thanks to Encore: Action I was able to watch it just a few hours. My initial reaction is WTF? 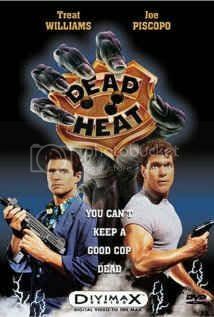 Dead Heat is a mixture of cop film,comedy, and horror. Why the plot isn't particularly amazing , I found Treat Williams acting to be good. Piscopo is the comedic source in the film but a lot of his one-liners fell flat for me. The Renowned Vincent Price has a role in the film which I thought was cool. The special effects were done very well for the time and the scene in the Chinese restaurant is brilliant if a bit ridiculous. It is a fun B style movie but for me the hype was better than movie itself. Dead Heat is worth a view but one I would not go out of my way to watch.